Dark-eyed Junco (Junco hyemalis). Photo by Carla Vanderbilt. When you step outside in the springtime, your senses are often inundated with the warmth of the air, the smell of flowers, and the songs and calls of numerous species of birds. The loud, broadcast songs that you are hearing often carry two messages simultaneously.1 First, the song serves as a territorial marker to deter rival males from approaching. Second, and perhaps more importantly, the song attracts females. A male’s singing ability plays a large role in determining which territory he gets, who he mates with, and ultimately his fitness. I study low-amplitude singing behavior in Dark-eyed Juncos (Junco hyemalis), a common species of sparrow that is a frequent winter visitor to bird feeders across the continental United States.5 When I first began my research, I was mainly interested in determining the social function of the junco’s whispered songs. In which types of social interactions do males whisper? Are the structure and functions of these whispered songs similar or different from the loud, broadcast songs that are easily overheard? To begin to answer these questions, my team and I simulated social interactions on the territories of wild, male juncos and observed the types of songs that males produced in each social context.4 To simulate an aggressive interaction with a rival male, we placed a live, caged male junco on a male’s territory and also had a speaker nearby playing a recording of a loud, broadcast junco song. Then to simulate a courtship interaction we presented a live, caged female and played a recording of a female mating call. Example of a simulated social interaction. 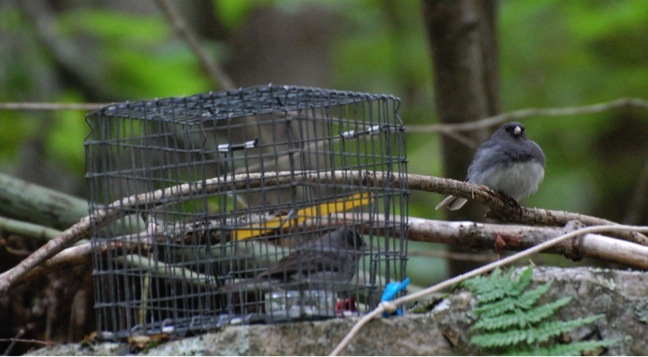 The wild, male junco on the right approaches the caged, female junco and sings a whispered courtship song. Photo by Joe Welklin. We found that the male territory owners sang both loud and whispered versions of their broadcast song in response to both the rival male and the potential female mate. 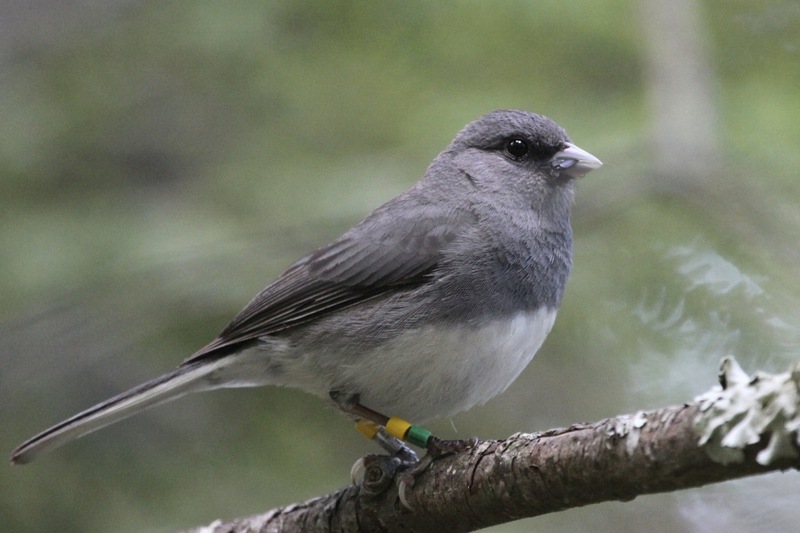 This result indicated that the function of the junco’s broadcast song in repelling males and attracting females is the same regardless of how loudly it is produced. 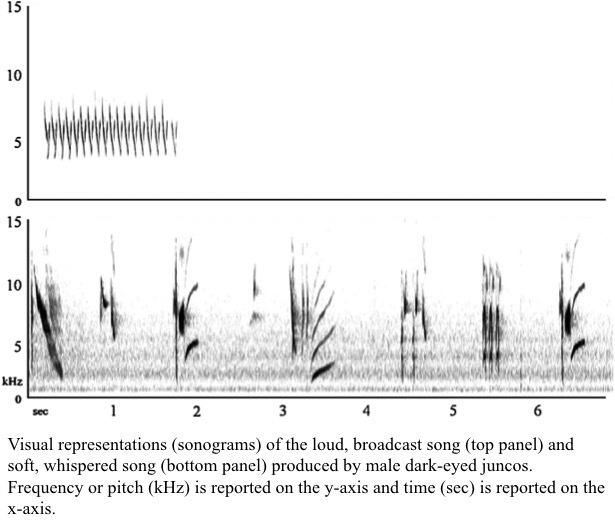 However, males also produced a different whispered song only in response to a female, and this song was substantially more variable and complex than the broadcast song (see sonogram and listen below). While singing the complex whispered song males also performed visual displays such as puffing their body feathers and fanning their tails. Considered together, these observations indicated that the complex whisper song has an important role in the male’s courtship display. The production of a complex, whispered courtship song has been observed in other songbird species, as well as in insects, frogs, and bats, suggesting that this behavior may be a relatively common phenomenon.2 Outside of courtship, research done in other species of songbirds has also revealed that producing whispered songs during male-male interactions can be a very reliable predictor of whether or not the singer is likely to attack, making certain whispered songs one of the most aggressive signals that a male can send.6,7 Collectively, it’s becoming clear that whispered songs and calls are playing a much larger role in social behavior than previously thought. So the next time you’re outside and overhear some quiet twittering, pay attention, because you may get to observe some secretive courtship or an intense fight between two rivals. Catchpole, C. K., and P. J. B. Slater. 2008, Bird Song: Biological Themes and Variations, v. 2. Cambridge, Cambridge University Press. Reichard, D. G., and R. C. Anderson. 2015. Why signal softly? The structure, function and evolutionary significance of low-amplitude signals. Animal Behaviour (in press). Reichard, D. G., and J. F. Welklin. 2015. On the existence and potential functions of low-amplitude vocalizations in North American birds. The Auk: Ornithological Advances 132:156-166. Reichard, D. G., R. J. Rice, E. M. Schultz, and S. E. Schrock. 2013. Low-amplitude songs produced by male dark-eyed juncos (Junco hyemalis) differ when sung during intra- and inter-sexual interactions. Behaviour 150:1183–1202. Hof, D., and N. Hazlett. 2010. Low-amplitude song predicts attack in a North American wood warbler. Animal Behaviour 80:821-828. Searcy, W. A., R. C. Anderson, and S. Nowicki. 2006. Bird song as a signal of aggressive intent. Behavioral Ecology and Sociobiology 60:234-241.